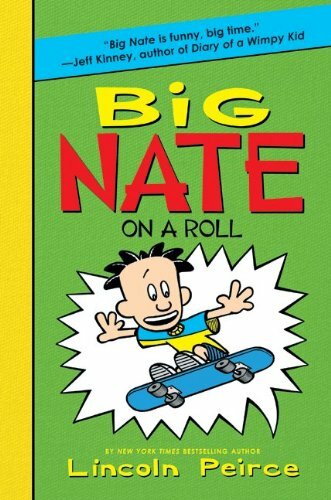 Description: Big Nate is on a roll! Nate’s a big deal in his scout troop . . . until Artur—aka Mr. Perfect—joins up. Now Nate’s stuck in second place. And Artur means business. Will Nate take the grand prize? Or wipe out, big time? Jake's Review: I love when you get me these books mom, because I get to share them at school and all my buds like them. Nate is so funny and he is sorta like me. He gets in trouble all the time and likes to skateboard as much as I do. The story goes by really fast and I wish it was longer. Nate's Dad is kinda dumb but I like him because he is dumb. I hate Spitzy the Dog because he is annoying and really ugly looking. The only thing I didn't like were that some of the pictures were not complete, but Mom explained to me that this copy is an ARC and the completed version will look better. I really can't wait till the next Nate book comes out, because I like these books as much as I like the Wimpy Kid books. Mom's Review: These books are absolutely delightful and perfect for the middle school reader, especially for the reluctant ones. Jake loves lending these to Brian because Brian will actually read them (Books and Brian do not go together) and Brian's mom loves them because of this. These are also great books for adult readers because we all have a bit of Nate in us. His honesty and wit will make even the more jaded reader laugh. The story is nice and fast paced so most kids will be hooked and not want to put it down -- which will keep them away from their iPods for a while (Jake's note: I heard that and totally know who you are talking about). School and Public Libraries would be smart to have a couple of copies of each of the titles in the series -- trust me they will be well used.